also a Certified Nutrition Specialist. Her book The Fat Flush Plan®, is a program tailored around cleansing your liver and combining essential fats, such as flax seed oil with quality carbohydrates, healthy proteins, essential spices and chia seeds. I have to take a minute to talk about the chia seeds which I LOVE……..Chia seeds are an ancient seed that the Mayan culture used regularly in their diet. They are high in protein, a high source of Omega 3’s and are a fantastic source of fiber. I love these things!!! When I am craving an afternoon snack I like to mix them with some unsweetened almond or coconut milk, a little stevia and a little cinnamon in a glass. The seeds will start to gel up and it ends up as your own personal pudding. Amzing and delicious…..especially if you are craving something a little like dessert. O.k. sorry …….back to the Fat Flush plan review……. By using this plan your liver will start to detoxify and will be working at it optimum level accelerating your weight loss and improving your health and vitality as a result. For Hypothyroidism and diet patients this may be a new approach to the way you eat. 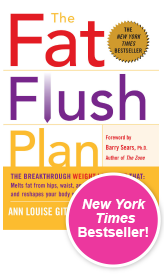 You will start “flushing out” the fat your body has been stubbornly holding on to for way too long. The foreword of the book is written by Barry Sears the author of “The Zone”. You can read my review of “The Zone” here. He also discuss the benefits of fats like fish oil, GLA (gamma-linoic acid) and CLA (conjugated linoic acid) and how his research and Ann Louise’s research have been so similar. Sears and Gittleman both agree on the importance of supplements to help maintain a healthy body weight. I wanted to include a video below from Dr. Ann Louise so you can get a an overview of the plan before I get into the 3 different phases of the plan. You will start with Phase 1 which is a 2 week fat flush. During this time you will support your liver, eliminate dairy (it is one of the top 5 food allergens in most people) and cut out grains, breads and starchy vegetables. This is the first important step in your Hypothyroidism and diet journey. You will also incorporate a delicious cran-water into your daily regime. This is 1 oz of unsweetened cranberry juice and 7 oz of water. I like to add a little stevia as well as a natural sweetener. I buy my unsweetened cranberry juice at Trader Joes. Very refreshing!!!! I think of this part of the plan as a new beginning similar to when my boys were babies and I would only introduce 1 food at a time to see if there was an adverse reaction. 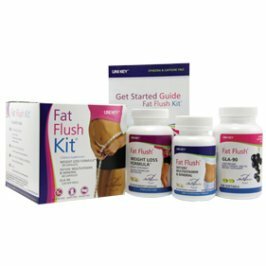 During these two weeks many Fat Flushers have been known to drop 10 to 15 pounds using the starter bundle. This may or may not be the case for you especially if you suffer from Hypothyroidism. Keep in mind that if you eat very healthy already, your weight loss may be less. Also if you only have a few pounds to lose your weight loss may be slower as well. Ann Louise also recommends certain supplements to take while moving throughout the different phases. These supplements are recommended to help your body get all of the nutrients needed and help speed up the fat burning process and get your metabolism fired up. After completing the first 2 weeks you will move to Phase 2 which is called “Ongoing Fat Flush.” In this diet phase you will continue to lose weight but at a slower pace. You will now be able to add back in some health carbohydrates. YEA!!!! You will stay on this portion of the plan until you have lost the pounds you need to. The expectation in this section of the diet plan is to lose weight at a reasonable and responsible rate while adding items back into your eating plan such as sprouted wheat bread. According to the author, sprouted wheat tends to be more easily tolerated by most folks than whole wheat. Many doctors and nutritionists recommend Hypothyroidism and Hashimoto’s patients reduce or eliminate wheat or gluten from their diet anyway. Once you have completed Phase 2 you will move to Phase 3 which is The Lifestyle Eating Plan. This is really the maintenance diet phase and essentially important for Hypothyroidism patients and their diet. This is the opportunity to add dairy back into your diet and note your responses. Did you gain weight? How did you feel? Ann Louise speaks to food intolerances in her book, especially gluten intolerance, quite frequently which many of us have and are not even aware of. If you not taken a gluten intolerance test this may be something to consider. I have decided to cut gluten out of my diet altogether. As part of the book Ann Louise lays out the plan, the recipes, a shopping list and a FAQ section at the end of the book. This along with her sharing her knowledge of the body and how our metabolism and organs process the food we eat is fascinating. You can also join the Ann Louise forum that answers questions you may have about the plan and share your successes. I have found the forum useful in getting good ideas that have helped other Fat Flushers in their journey. You may even find other Hypothyroidism and diet patients in the forums to share you experience with. If you haven’t tried the Fat Flush Plan yet it’s worth a try. Take some of the guess work out of dieting and join the many Fat Flushers out there that are healthier, happier, a lot lighter and have had great success with the program. Hypothyroidism and diet is the ultimate challenge, don’t let your Hypothyroidism win.